Who said civil society can't have an impact in Damascus. Plans to destroy decades old shops in Amara caused outrage last year. It was all in the name of progress - knock-down the shops, and widen the road. That would mean less traffic in the Old City. But critics said it would damage the city walls. It was part of a grand scheme to eventually ban traffic from the whole of the Old City. But that can't be done until there is an alternative - at the moment, the roads outside the northern city walls are chaotic. Shopkeepers were furious at the plans, a Facebook and Blogger campaign was launched. That led to a petition. And eventually journalists got wind of the proposals and it made the international news. 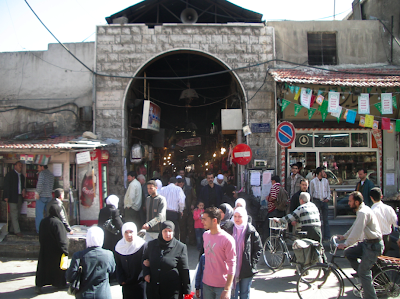 Then the bombshell - just months before Damascus began its year as Arab Capital of Culture, UNESCO threatened to withdraw Damascus's World Heritage Site status unless more is done to protect the Old City. Quietly, the plans were dropped - thirty years after they first surfaced. Victory for the Old City. Although the net has stayed very quiet about the change of plan. It seems the price to pay is that traffic isn't going to be banned from the Old City - and that could end up being far more damaging than the Amara proposals. On the other side of the Old City, something equally destructive has been happening for the past year - more on that soon. thanks for the update. I was wondering if the petition and blogger coverage yielded anything fruitful. what impact of the civil society are you talking about? after rereading your post, i realized that you used the term "civil society" to refer to shopkeepers, bloggers, facebook users, and journalists. i am confused about the term actually, it is usually used with ngos and civic institutions in comparison to governmental ones. i think here since the government is the one who's destroying old damascus, that leaves "the people" of damascus and the local community of old damascus along with the ngos to oppose the proposals, and that's what happened. in other words, it is not just the civic ngos that were making a fuss about it. and i am not sure if it is because of the people of damascus that the syrian government changed its mind. i think the UNESCO pressure contributed to drop the plans. That is exactly my point. The Unesco pressure only came about because of the civil society campaign. And civil society means any non-governmental group or community - it doesn't need to be as centralised as an NGO or campaign group. The most genuine element of civil society is a spontaneous "issue community" which arises, like in this case a "community" of concerned shopkeepers and residents. What you wrote indicate that the Syrian government listen to public opinion , in a dictatorship the dictator usually does not listen to criticism , Syrians should be proud that they can change government policy. Why don't they make the old city closed to motor vehicles except for product delivery. and have parking lots at the edge of the old city even underground .